Divorce is hard to navigate. It's tough for both parents and kids. Many of you in this situation know that holidays can be tough. Sharing a child at any time of year is heartbreaking. Sharing a child during the holidays is heart wrenching, given that it's a time of fun and joy. My stepson has the best of both worlds: A life he loves at home with us, and another life he loves at his other home with his mom. With a holiday season of celebrating and entertaining just around the corner, it can be stressful. And all the more challenging when you add divorced parents with children to the mix. 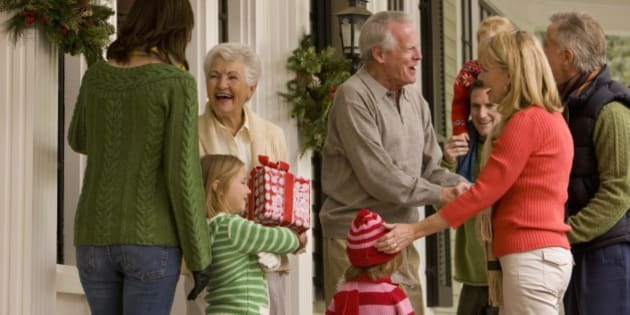 Are you distressed because it's not your turn this year to have your child for the holidays? You are not alone. Rest assured there's a solution that may pleasantly surprise you. My parents split up when I was a young girl. I didn't look forward to the holidays. Underneath that layer of sadness, I knew that one of my parents would spend the holidays alone. As a child, I felt guilty and sad for my other parent. Truth be told, divorce is hard to navigate. It's tough for both parents and kids. Many of you in this situation know that holidays can be tough. Sharing a child at any time of year is heartbreaking. Sharing a child during the holidays is heart wrenching, given that it's a time of fun and joy. On Christmas morning, many years ago, my husband and I experienced our first heart-wrenching holiday event when my stepson's mom picked him up. We waved goodbye in tears and felt empty without him on Christmas Day. It was painful. As the years passed, we got used to the situation. We adapted and logically thought about his well-being. As co-parents, you know your children's needs come first. We went from hurt, angry parents, to constructive, successful co-parents. We needed to make things work harmoniously. Children do as well as their parents. They learn by osmosis and we are their role models. The better parents communicate and resolve issues, the better their kids succeed in their own relationships in life. However, easier said than done. My stepson was three when he last spent the holidays with both of his parents and he very much expressed his desire for this to happen again. We were stunned when he asked to spend Christmas Eve with both sets of parents. As parents we really had to step out of our comfort zone to grant him this wish. As avant-garde as it may sound, we said yes to the unthinkable. We set aside our differences and gave him the only thing he asked for that year. Was it difficult to open the door to the woman of my husband's past? Yes, it was, but we did it for the sake of my stepson. That year, we invited his mom and her new family to our home for the holidays. I recall how uncomfortable we all felt at the beginning. Eventually, we relaxed with a glass of wine and made it through unscathed. With love, understanding and flexibility, we successfully fulfilled our child's wish and fundamental needs. As a result of my stepson's wish, it has become a beautiful family tradition. Every year, we alternate houses and my stepson joined the loop now that he has a house of his own. To top it off, former in-laws have also joined us. Awesomely, my husband continues the tradition as Santa Claus. Our special gift of unconditional love to our son was the greatest gift to us all. It doesn't come in a beautifully wrapped package; it comes from our hearts. This is our WOW moment! It is unfortunate however, that this arrangement occurs in very few divorced families. It usually works when divorced parents try to cooperate when co-parenting their children. To sit at the same dinner table and serve dinner to your former spouse and her extended family members, requires that parents be respectful, mature, and not feel threatened that one parent is better than the other. It takes courage and self-control to celebrate holidays with your ex-spouse. Being child-centered is key. To do this, we must challenge our anchored beliefs and do what we think we cannot. Doing so provides our children with the best environment in which to thrive. We are capable of this for the love of a child, unconditional love that is, when we focus on healthy interactions. Thanks to my stepson's request we are all better people for it. We broke the cycle and created a new one. Exes do not have to be in conflict forever. 1. Listen: Don't shut your children off. Actively listen to what they have to say when they have a suggestion, no matter how ridiculous or impossible you think it might be. Pay attention. Listen to what they're saying and don't think of the answer while they're talking. Why rob them of special moments? Listen wholeheartedly. 2. Understand: What are your children really trying to express? Sometimes they cannot find the right words to explain what they want to say. They seek emotions, comfort, and reassurance. Children need to know and feel they are loved by both parents and step-parents without guilt or shame. 3. Be Flexible: Once you really hear and understand what your children need, it is easier to be open to other possibilities. Shift your mindset from spouse-partner to co-parent, reducing negative thoughts about your ex-spouse to enjoy a positive co-parenting gathering. In flexibility there's possibility to make situations better for everyone involved. Co-parenting in harmony is possible. With a listening ear, understanding, and flexibility, you too can create joyful holidays to do the unthinkable by granting your child's wish. Let's make the holidays about fun and laughter. Holidays are magical. Let's all spread the magic one co-parent at a time. It takes a village to build a harmonious family environment. As a co-parenting coach, I help parents and step-parents resolve hurtful communications. I offer guidance through the transition from spouse-partners to co-parents to help build an effective co-parenting plan to create a harmonious family environment all in the best interest of your children. To all you amazing co-parents, cheers to joyful holidays!